Create unique Do-it-Yourself bracelets, necklaces, rings and more Our DIY Rubber Band Bracelet Maker Kit Includes: 1 adjustable bracelet loom, 1 hook (youth-safe plastic), 30 c-clips , 600 latex free rubber bands (8 different colors, rubber band colors may vary). 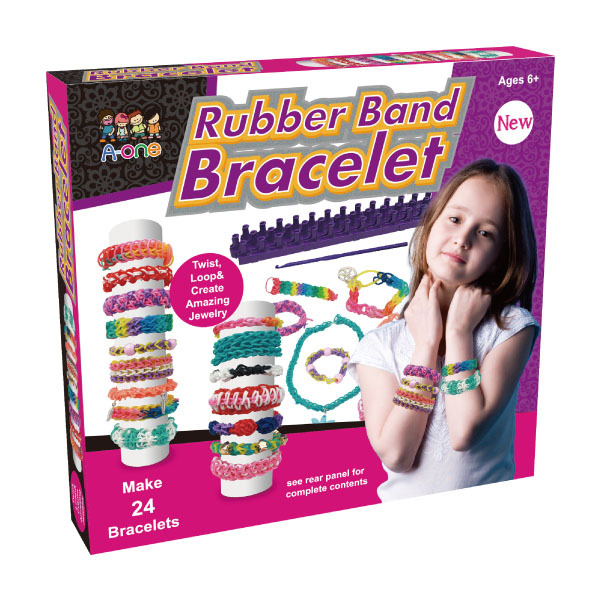 Make 24 colorful, fun to wear rubber band bracelets with this loom kit. Experiment with colors and patterns to see what great combinations you can create.